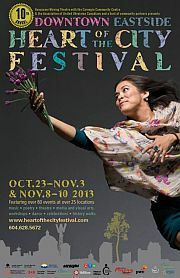 See AHA MEDIA’s coverage of last year’s Heart of the City Festival 2012 in reverse chronological order. Our purpose is to live in community, and community is care, care for one another, care for those least able to care for themselves, care for all, care in action. 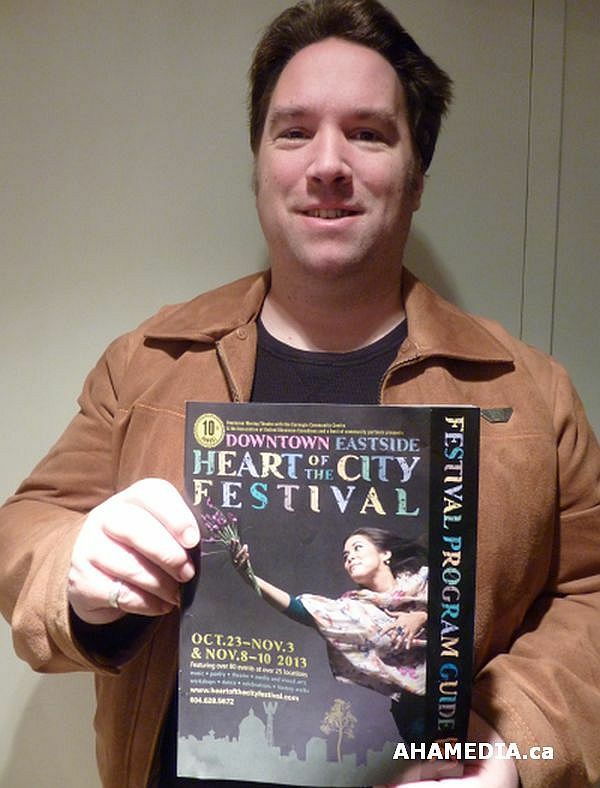 The festival, and the Downtown Eastside community, is recognized across Canada as a leader in community arts. Since our founding the festival has presented over 1,000 events featuring approximately 10,000 artists of all ages, backgrounds, abilities, cultural backgrounds and art forms. Featuring over 80 events at over 25 locations throughout the Downtown Eastside with special anniversary events including the premiere of Bread and Salt on the post-festival weekend of November 8-10. Join us and enjoy our annual feast of twelve days of music, stories, songs, poetry, cultural celebrations, films, theatre, dance, processions, spoken word, workshops, discussions, gallery exhibits, mixed media, art talks, history talks, walking tours, and a diverse array of artist showcases. • Bread and Salt, tribute to the historic Ukrainian Canadian community in the historic East End. Presented by Vancouver Moving Theatre with the Association of United Ukrainian Canadians. The mandate of the Downtown Eastside Heart of the City Festival is to profile and foster the development of community arts in the Downtown Eastside – from community building and bridge building, to celebrating artists and cultures, to giving voice to local concerns. The festival involves a wide range of professional, community, emerging and student artists, and lovers of the arts. Over 1,000 artists participated in last year’s 2012 Festival. Most events are free or suggested donation. The complete 2012 Festival Program is now available! Click here for a list of locations throughout the city where you can pick up a guide. To be notified of changes and updates, like us on Facebook and follow us on Twitter. And make sure you check out our Festival Picks, a list of some of the anticipated highlights of this year’s festival.